ORGANISATIONAL LEARNING – IT TAKES SOME TRAINING. A factory owner was battling with productivity. He called in blue chip advisors to address the problem. They could not help. He called in specialist niche firms. They could not help. In desperation he called in a contractor he had been referred too. The contractor walked around the factory for ten minutes. He stopped at a machine and turned a screw one half turn. Productivity soared immediately. The delighted factory owner requested the invoice. It said, ‘Fee for addressing productivity issues’ – $20,000. The factory owner was astounded; $20,000 for 10 minutes work? He asked for an itemised invoice. It said; Fee for turning screw – $5. Fee for knowing which screw to turn – $19,995. It’s an old story, but one I appreciate. It illustrates the difference between training and knowledge. Individuals attend training and education sessions to develop their skills and knowledge. 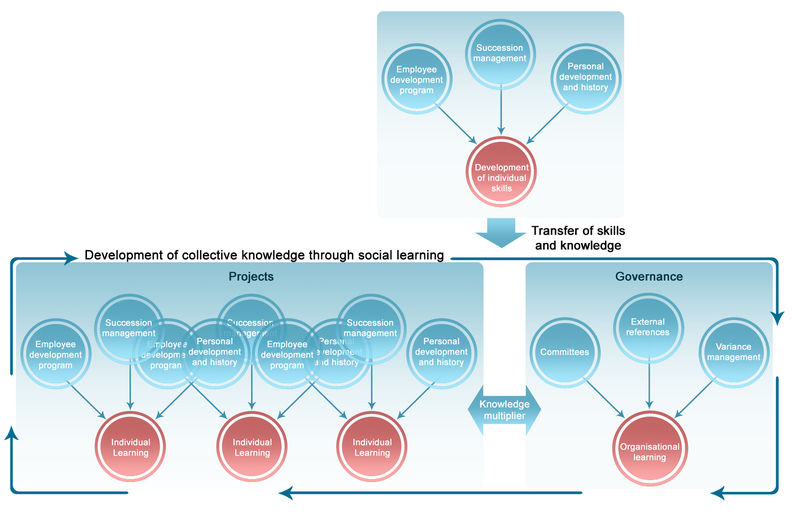 This raises the questions; 1) can individually ‘owned’ skill and knowledge be transferred to the organisation and 2) can organisations learn in their own right. I believe the answer to both these questions is yes, but the inputs and variables for organisational learning are different to those for individuals. Broadly speaking, (within the work context), individual learning has three inputs. Employee development is the partner event to the performance appraisal. Typically an employee’s performance is appraised annually and a development program is constructed to address weaknesses identified through the review. It is common that the development program is reviewed and refined quarterly while the performance review is held annually. The intent of the development program is to build the skills of the individual. These can technical, managerial, or soft skills. 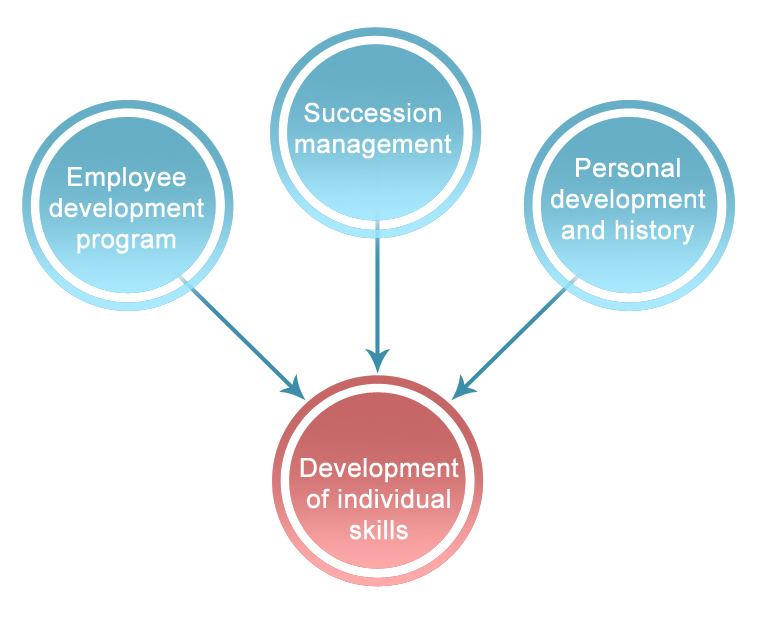 Succession management is closely related to the employee development program but the time horizon can be out 5 years and succession management will consider and include additional organisational factors. An important distinction is that organisations can have an employee development program without having a formal succession management plan, but not vice versa. For the purposes of this article, Personal development includes all other implicit or explicit learning an individual receives that makes them a better employee at work. These three variables focus on the individual and collectively deliver very talented individual – who could leave the company at any time. To minimise this risk, companies pour considerable sums of money into technology under the banner of ‘knowledge management’. I support this approach but consider this knowledge capture, not organisational learning. Knowledge management in the form of technology and documentation will not be addressed in this document. Organisational learning is the transfer of knowledge from the individual to the group through social interaction. You can transfer knowledge to a group, but you cannot transfer skills. Skills can only be transferred between individuals. The most fundamental principle of organisational learning is that an organisation can only learn if it wants to. When this is the case, an organisation will create time to learn. Creating time requires an organisation to stop ‘doing things’ and start spending time to explicitly understand what and why they are doing what they do. 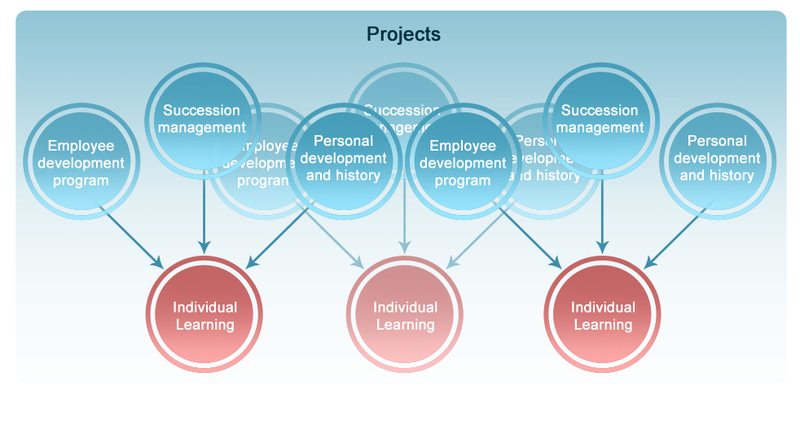 Projects are the traditional environment for organisational learning. Projects are where individuals’ come together to combine their individual learning to deliver an outcome that an individual could not easily deliver on their own. The project environment is by its nature a social environment; one where conversation is stimulated and the sharing of ideas promoted. It establishes a virtual bank of knowledge that represents the sum of all inputs. At the start of the project each member should present and teach the other team members as to how they will approach their responsibilities on the project. Then through the course of the project, each member should lead a discussion on lessons learnt to date. What has worked and what hasn’t as compared to their original presentation. The principle is that you are always learning and while these lessons are fresh in your mind, you formally share them with team. These discussions do not need to be long, but they should be formal and frequent. The audience can be restricted to the immediate group of business and project stakeholders. This approach requires some additional project time. The project budget (time and cost) should allow for these sessions and the sponsor should accept the project will be delivered a week or two later than if you did not include these knowledge sharing activities. If projects do not allow formal time for learning and the socialisation of the lessons, then the dissemination of knowledge is reduced to osmosis. Business as usual differs from projects in that the social interactions are not readily recognised as organisational learning opportunities. The primary enabler for organisational learning in the business as usual environment is the organisational approach to governance. 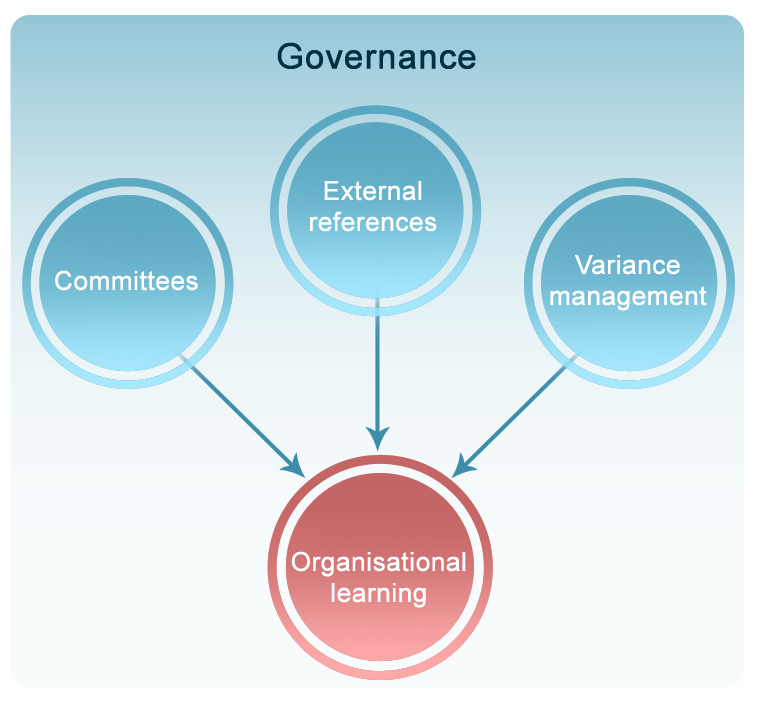 Effective governance is characterised by structured committees and the active management of variance. Committees are a group of individuals meeting to discuss agenda items. Within these meetings, time should be allowed to formally reflect on lessons learnt by the committee over the last period. Depending on the committee, this reflection could happen only twice a year. Variance management is one of the most important social interactions for organisational learning and its importance increases with seniority in the company. At the senior levels, business objectives can only be achieved through teamwork and variance to plan is a team responsibility. As you move lower down the organisation variances can be attributed to individual managers or team leaders. Notwithstanding, a variance is an opportunity to explicitly consider what went wrong and what needs to change. If these conversations are seen as a learning opportunity then organisational learning is promoted. The exchange of ‘lessons learnt’ between the two social contexts becomes a knowledge multiplier. At the completion of the project ‘lessons learnt’ should be collated and formally presented to the wider stakeholder community. This will transfer knowledge to the widest group possible and help avoid a repeat of issues on the next project. Equally, ‘business as usual’ should formally present to project teams on their experience of the project and their experience on the business impact of the project. The organisational learning environment is complete when the organisation formally recognises each component and maximises the value in the interaction between them. I am not suggesting that organisations learn randomly. The learning curriculum for an organisation is defined by its business strategy and the organisational capabilities required to deliver the strategy. Organisational capability is created by teams of people working together – the whole is greater than the sum of the parts. 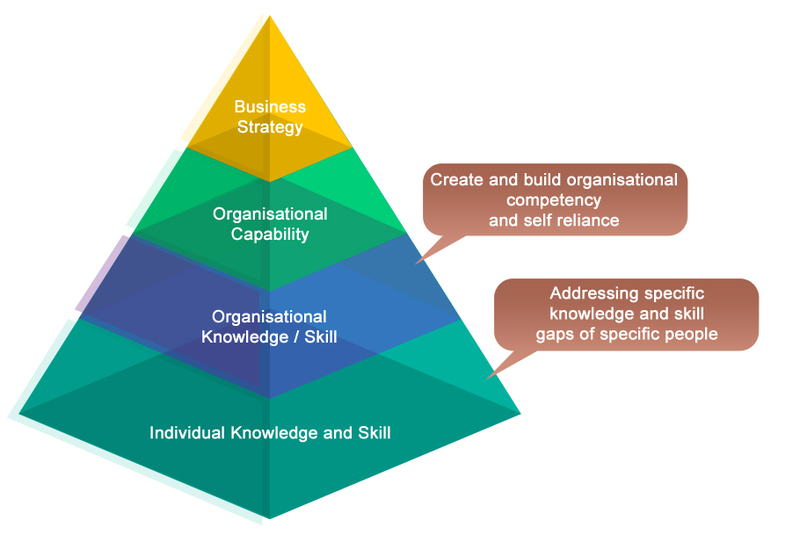 This hierarchy has a foundation on the knowledge and skills of individuals. I close with a repetition of the most important aspect of organisation learning – organisations have to want to learn. If they do, then the above social events are the time to do it as they provide a consistent and enduring environment for active learning. Delivering a course on change management in India.